Liner shorts can be a good option at times, allowing for mid-length-distance cycling comfort in even the most innocuous and non-technical of outfits – flying under the radar if you will. The Gore Bike Wear Inner Lady Tights+ are specifically designed to be low-profile undershorts, for use with all Gore Bike Wear women's looser fit shorts, but just as useful with any other outfit. For those times when the Lycra look just isn't what's required, liner shorts can be worn under looser fit 'baggies', cycling capris, a dress, or pretty much anything else really. The Inner Lady Tights+ are super-lightweight and feature large mesh panels, making them very suitable for wearing under something else without causing overheating. The Contest Women pad is aimed at short to mid-distance rides, but I'd be quite happy to take it out on mid-distances with no worries at all. It's well shaped and contoured well to my body, thanks to the more traditional Lycra panels surrounding it. There are still leg grippers to give a secure and comfortable fit, and thankfully they didn't result in the sausage effect that some shorts cause, making them relatively easily hidden. The length finished mid-thigh for me (5ft 5in), good for wearing under other clothing. The broad elastic waistband, with loops for attaching to Gore outer shorts and trousers, was also comfortable and kept the shorts nicely in place while riding, with no discomfort. The mesh panels were fairly discreet so didn't shout out 'underwear!'. 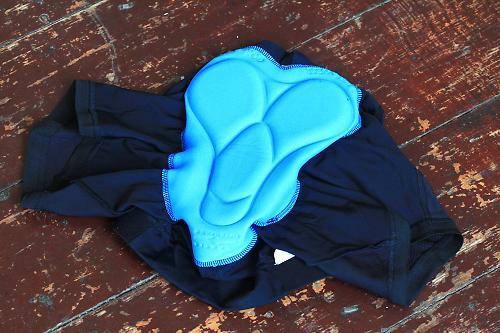 Ride comfort was good, thanks to the mesh ventilation and the pad, and though they are on the expensive side, for dedicated liner shorts they're a definite cut above cheaper ones I've tried, and well worth the money. Designed as a liner for short to mid-distance rides, primarily to be worn under Gore's baggy shorts and trousers. Definitely up to the job for mid-length rides and spot on as a liner short. Very well made using high quality fabrics and with a good level of finish. Very comfortable and exceptionally breathable. Seem robust despite the mesh panels. Nice and lightweight for under other shorts/trousers. Breathe well and pad is definitely comfortable enough for mid-length rides. Not the cheapest liner shorts but considerably better quality and performance than most cheaper options, so a sound investment. Mesh panels, traditional Lycra around pad to help it remain contoured to the body, length of leg, quality of pad and fabrics, waistband.